Kodak 9000® Cone Beam technology provides a digital tomographic 3D view of the patient’s area of concern. A traditional x-ray is two-dimensional. With CBCT technology, the doctor is able to get a full 360 ° view of the tooth and all surrounding areas. 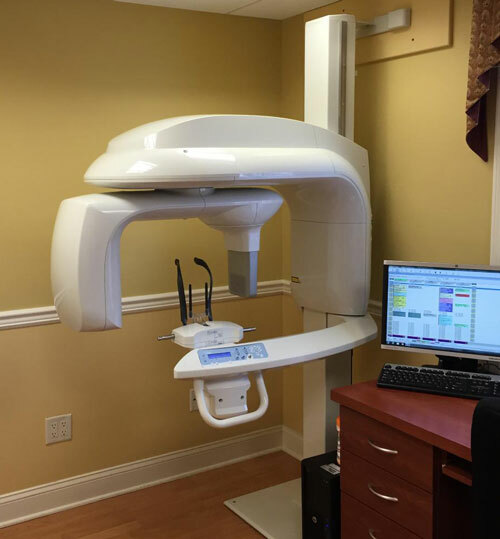 The 3D Cone Beam scanner provides nearly limitless views of the teeth while using less radiation than traditional medical CT technology. This new technology is fast, simple and painless, providing many wonderful benefits for patients. In our office, we use a low radiation digital x-ray system which greatly reduces the amount of radiation needed as compared to film x-rays. The improved diagnostic capability of digital x-rays and the ability to view the x-rays on a computer screen allow the patient to better understand and follow treatment. By eliminating film, developer and chemical waste, digital-rays are better for both the patient and the environment. Our office proudly uses surgical microscopes for all endodontic procedures performed in our office, providing our patients the most advanced technology available. The use of specialized operating microscopes means that the doctor is able to get a detailed look at the anatomy of the root canal during all phases of treatment. The additional magnification and illumination allow them to work with great precision and see small details such as calcified canals and fractures. The doctor is able to more accurately diagnose and treat the patient using a dental surgical microscope to improve the potential outcome of the treatment. An intraoral camera combines the latest video technologies with dental care. Both the patient and dentist can see detailed images of the teeth and mouth in real time. With an intraoral camera, patients are able to better understand what is happening and review the status of their oral health.